A new portable SCULPT synthesizer by Modal Electronics is already on KickStarter! Two days ago, a British company Modal Electronics launched its new portable synthesizer SCULPT on Kickstarter. 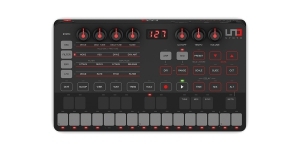 This is the first instrument in the new portable synthesizers line called "Machines for musicians", wich will, as well as the CRAFT line, consist of small instruments with a great functionality.